Ontario's Greater Golden Horseshoe region has been undergoing a dramatic economic transformation and painful restructuring over the past decade. This vast area, made up of 110 municipal jurisdictions, is reeling from the loss of almost 200,000 manufacturing jobs since 2001, mostly in older industrial areas. These losses are part of a broader transformation of the economy of the region and changing employment patterns. The transformation is linked to freer trade and globalization, which open up new markets and growth opportunities for GGH businesses, but also expose them to wider and intensified competition. It is underpinned by new information and communications technologies that allow the production of goods and services to be managed at a distance and the inexpensive and instantaneous flow of information, ideas, capital, and digital products around the world. This study argues that the conventional explanation of the economic restructuring currently under way - often described as a shift from manufacturing to service industries - does not accurately capture the dynamics of change nor provide decision makers with the kind of information they need to plan effectively for a competitive city-region. The change is better described as a shift from low-value-added to high-value-added activities, from low-knowledge-content to knowledge-intensive activities, and from routine to creative and executive activities. This distinction holds whether the activities are in the manufacturing or services sector and calls for a more nuanced understanding of what is happening on the ground. The Growth Plan for the Greater Golden Horseshoe is the long-range Plan established by the Province of Ontario in 2006 to manage growth and curb sprawl. It and The Big Move (the regional transportation plan for the Greater Toronto and Hamilton Area) are intended to work together to promote prosperity in the region. This study shows that the Growth Plan and The Big Move, which are currently under review, do not address the challenges and opportunities of a globalizing regional economy or the reality of a transforming economic landscape. The Growth Plan's focus has largely been on managing residential growth rather than non-residential and employment-related development. Indeed, the Growth Plan is based on shockingly little hard evidence on the evolving economy of the region. Plans for city-regions a fraction of the size of the GGH typically involve more economic research, analysis, and evidence. This report tackles the evidence gap in planning for a more competitive region by describing key aspects of economic restructuring, the evolving economic geography of the region, and its current spatial structure using Labour Force Survey data, Census Place of Work data, and data from the Transportation Tomorrow Survey. The analysis, which looks at job loss and gain across the region between 2001 and 2011 (and in some cases 2014), focuses on the "tradeable" sectors - also termed "core" employment. These jobs produce goods and services that can be exported, or that draw income into the region. They are distinct from "population-related" employment or "local" services. 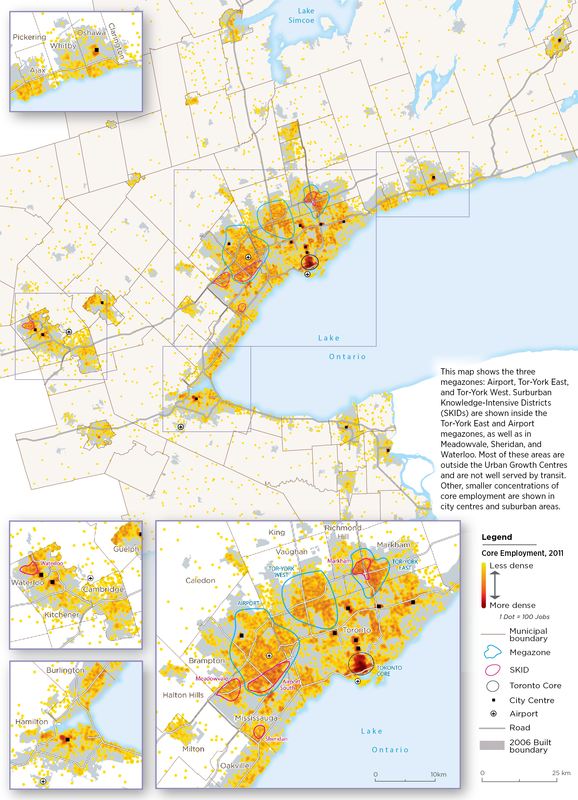 What emerges from the analysis is the outline of a region characterized by a very dense Downtown Toronto employment area with almost 465,000 jobs, as well as three large and significant multi-jurisdictional suburban employment areas with tremendous potential and challenges that need to be addressed and for which there is no discernable provincial or regional strategy. We call these three areas employment "megazones"; together they contain about 543,000 jobs (see Map E1). The megazones, along with Downtown Toronto and several concentrations of knowledge-intensive firms (which we call Suburban Knowledge-Intensive Districts or SKIDs), have attracted a significant share of job growth. Core employment in these areas grew 10% between 2001 and 2011, whereas the rest of the region experienced a 6% decrease in these types of jobs. Together with Downtown Toronto, the megazones and SKIDS account for 31% of all employment and 41% of the GGH's core employment. Moreover, more than 80% of the jobs in the megazones and SKIDs are core employment activities, compared with 62% for the GGH as a whole. The first megazone (Airport) encircles Pearson airport and is the second-largest concentration of employment in Canada, after the Toronto core. It represents about 300,000 jobs, more than the individual central business districts of Montreal, Vancouver, or Calgary, and it is continuing to grow. The second (Tor-York East) is centred on the 404/407 highway interchange. The third (Tor-York West) stretches from the intersection of Highways 400 and 407 east to Keele Street and south into Toronto. The SKIDs include suburban business parks in Markham and the City of Waterloo, Meadowvale and the area south of Pearson Airport in Mississauga, and the area around the Sheridan Business Park in Oakville. The economic importance of Downtown Toronto, the three megazones, and the five SKIDs, as well as their implications for planning, cannot be overstated. Most of the net core employment growth in the region has also been focused on Downtown Toronto, the megazones, and SKIDs. Between 2001 and 2011, Downtown Toronto grew by 12% or about 43,000 jobs, while core employment in the rest of the City of Toronto fell by 12% or about 63,400 core jobs. Meanwhile, the megazones grew by 4% (about 17,500 jobs), and the SKIDs collectively grew by 27% (about 35,500 jobs). The growth in Downtown Toronto, the megazones, and the SKIDs is particularly remarkable since the GGH as a whole experienced a net decline of 0.1% in core employment between 2001 and 2011, reflecting, among other things, the loss of manufacturing jobs - particularly in older urban areas. Similar job losses are widespread in older industrial areas across the whole region as well as in older, inner suburban business parks. What sets the megazones and SKIDs apart from Downtown Toronto is the fact they are not well served by transit. In fact, the three multi-jurisdictional megazones alone account for about one million automobile trips daily, making them a heavy contributor to traffic congestion in the region. Moreover, the megazones and SKIDs are not recognized in the Growth Plan or The Big Move, which focus on future, aspirational growth locations, particularly the Urban Growth Centres (UGCs). Outside Toronto and Mississauga City Centre, UGCs do not represent significant concentrations of employment; some have even lost employment in the years since the Growth Plan was established in 2006. The competitiveness of businesses and of the region itself requires a regional structure that supports, among other things, access to transit and efficient intra-regional mobility. Workers in knowledge-intensive industries in particular are increasingly demanding work environments that offer mixed uses, local meeting places, a range of services, and accessibility without the need to use a car for all travel. In a global economy, the region faces intense competition from other city-regions in attracting highly mobile skilled workers as well as investment in new production facilities or corporate offices. In this context, certain characteristics of the physical environments of city-regions may support or hinder the competitiveness of business and regional prosperity. There is an opportunity for the Growth Plan to recognize and address the reality of the GGH's spatial economic structure (see Map E2). This could include a review of office uses in the region, of the role of the UGCs, and of the relationship between The Big Move and key employment areas. The success of billions of dollars in planned transit investment will depend upon aligning those investments with a regional structure and an urban form that attract large numbers of new riders to transit. Although the Growth Plan is, not surprisingly, focused on managing and accommodating growth, many areas of the region are experiencing job loss. These changes call for the strategic reurbanization of existing employment areas and a focus on replanning existing areas, rather than simply adding new employment land at the urban edge to accommodate new businesses. At the same time, the land supply process could be updated and modified to better reflect the dynamics of economic restructuring. There is an opportunity to think of employment not just as something to be "accommodated," but also in terms of its economic development potential and its role in shaping the urban environment and supporting transit investments. The report concludes with suggestions for further research to create the evidence base needed for effective regional planning. The absence of a regional economic development strategy for the Greater Golden Horseshoe, such as the one created by the Greater London Authority in the United Kingdom, makes the task of aligning planning policy with economic development challenging. The development of such a regional strategy, as called for by others, including the Toronto Region Board of Trade, would be extremely helpful. While a globalizing economy presents many challenges, the good news is that there are many natural synergies between economic restructuring and competitiveness, on one hand, and the Growth Plan and city-building on the other. Proximity, concentration, diversity, interaction, accessibility, efficiency, and the quality of the urban environment - these elements are at the core of the evolving economy. The Greater Golden Horseshoe represents one-quarter of the national economy and two-thirds of the provincial economy. Public investments of billions of dollars in infrastructure are pending. Grounding the Growth Plan and The Big Move in an understanding of the dynamics of economic restructuring is essential to their success, and to the prosperity of the region and province. THE SPATIAL ECONOMIC STRUCTURE OF MEGAZONES AND SUBURBAN KNOWLEDGE-INTENSIVE DISTRICTS IN THE GGH IS DISCONNECTED FROM THE REGIONAL STRUCTURE UNDERPINNING THE GROWTH PLAN AND THE BIG MOVE.